1. The chain 2 starting method- Chain 2 and make X amount of stitches into the second chain from the hook, making the first chain the beginning round. 2. The giant hole technique- Make X amount of chains, link them by joining to the first chain and then making X amount of stitches into the linked chain circle you created, making the stitches inside the linked chains your beginning round. 3. The Magic Circle- Start using a magic circle and making X amount of stitches into the magic circle to start your first round. 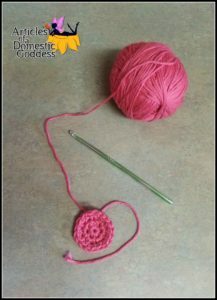 The reason that even when a pattern calls for either of these techniques, that I opt to use the magic circle is, it really is MAGIC!! When you do the chain 2 technique, or the giant hole technique they all leave one thing at the top of the hat or the center of the round… a GIANT HOLE! When using the magic circle technique, you create a circle to make your stitches around, then you pull it tight so that the hole closes completely.